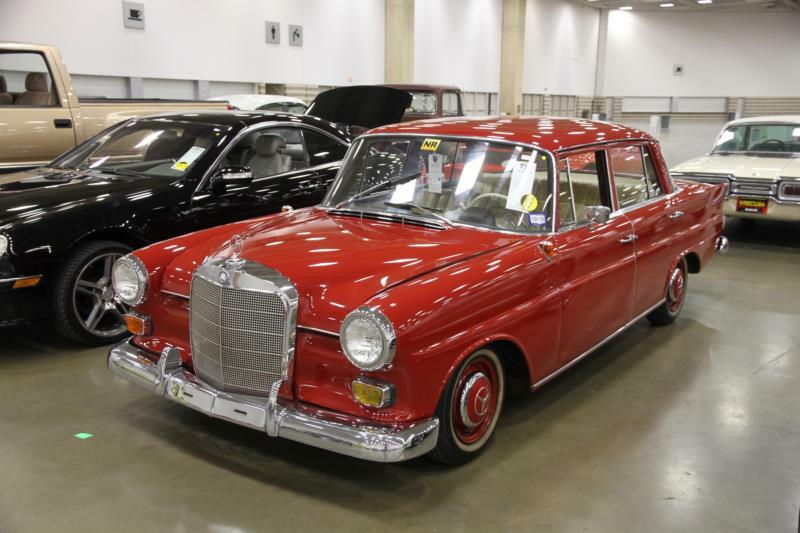 Mercedes-Benz followed the new 220 “fintail” models with a four-cylinder version to replace the old 180 series. The 190c and 190D (for diesel) were launched in April 1961 and would be produced until August 1965 before the first significant changes. The cabin and trunk were identical to the 220 fintail series but with much less trim, Bakelite interior panels instead of wood, and non-reclining seats. The front fenders were shorter than the 220, with single headlights on each side of the classic grille like the Ponton model. Turn signals were on top of the fenders, ahead of the windshield, as on the earlier car. The 190c proved very popular and 130,554 were sold by 1965, when the 90 bhp 1.9-liter OHC engine was replaced by a five-bearing, 2.0-liter, twin-carburetor engine. The new 200 model developed 104 bhp, and raised the top speed to 92 mph. It would be built until 1968. The diesel-powered, 80 bhp 190D was the choice of taxi drivers across Northern Europe, and the larger square trunk was much appreciated. Almost twice as many diesel-powered 190Ds were sold and 225,645 had left the factory by the end of 1965. The extra weight meant it wasn’t appreciably faster than the earlier 180 diesel, though, and it was somewhat thirstier. That said, it proved to be tough as nails, and during extensive testing in Africa and across Europe a 190D averaged 35 mpg. In 1962, both the gasoline and diesel 190 models gained front disc brakes, while coachbuilders Binz and Meissen began to offer station wagons, first as ambulances and then as Kombi estate cars. Both were fitted with larger 15-inch wheels. In late 1966 Mercedes-Benz contracted with IMA coachbuilders in Brussels to offer station wagon variants of all the fintail models. When the new 200 and 200D gained the aforementioned five-main bearing engine, a new 230 model was created by fitting a six-cylinder, 2.3-liter engine in the short-nose design. It was the same thinking that went into the six-cylinder 219, as a companion to the old 180 series. The 230 was deliberately plain, as the companion 250S was the entry level version of the new S-Class. The 200, 200D and 230 are easy to distinguish from earlier fintails, thanks to the combined front turn signals and fog lights below the headlights. More comfortable seats were fitted to all three models, and chrome trim added to the trunk lid and around the vents behind the side windows. As always, the 200D diesel outsold the gasoline-powered model two-to-one. Many of the 161,618 200D’s became taxis, while 70,207 buyers stepped up for the 200 gasoline model. The 230 caught on quickly with 40,258 units sold. None of these models are all that collectible, but they provided millions of miles of dependable motoring. The survivors continue to do so, and can be bought quite reasonably.